I fell in love with this dessert on my latest visit to Vietnam. The ones I tried from the States are overly sweet, the ones in Vietnam are not as heavy and more refreshing. 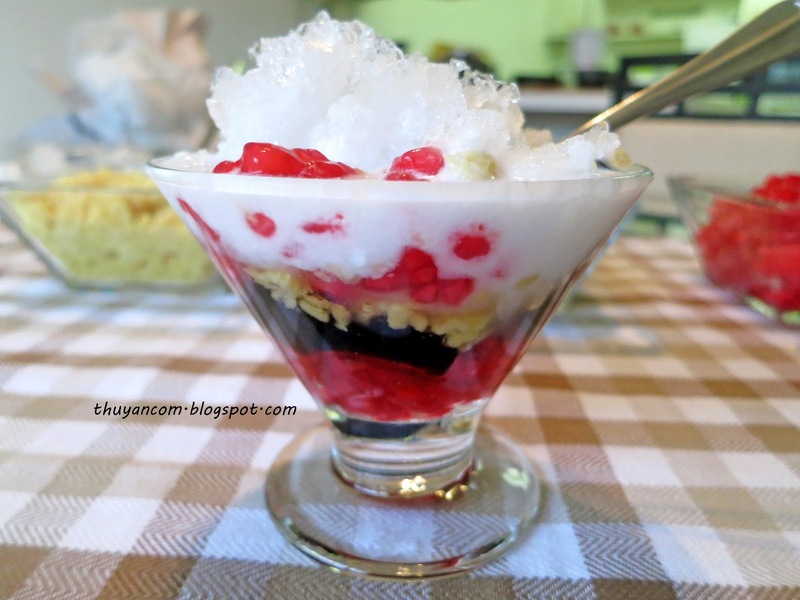 I love eating the "hot luu" which are suppose to be mock pomegranate seed made from tapioca and jicama. It's like eating the tapioca balls in bubble tea but with something in the center. I made this che on a hot sunny day during my last trip home and it was a hit! My mom really appreciate me making a batch for everybody because she thought it was such as hassle, but it really isn't that bad to make. You simply prepare are the components of the che; I used suong sa, hot luu, mung beans, coconut milk, sugar water, and crushed ice. Once that is all done you can just put together a cup to your liking. To cut back one some of the work I used canned suong sa which tasted just as good, but you can always make your own. I couldn't find any fresh jicama so I used canned water chestnut. Semi-homemade didn't cut back on taste here! 4. Place tapioca starch into a large mixing bowl. Separate the faux pomegranate into 3-4 batch. Add first batch of water chestnut to the tapioca starch and mix. Use a strainer so it's easier to separate. Keep adding tapioca starch to the water chestnut until it is evenly coated. Shake off the excess. 7. Once the red "pomegranate seed" float to the top, dump the whole pot into a colander and rinse with cold water. Place fresh "pomegranate seed" aside in the the bowl of ice water to cool. You can remove pomegranate seed from ice bath once it has cooled. 8. Repeat with remaining batch of water chestnut. You don't have to change tapioca starch between batch. Add more starch if needed. Now it's time to build your che! I put a layer of pomegranate seed at the bottom, grass jelly, mung beans, more pomegranate, simple syrup, coconut milk, and then ice. The great thing about this dessert is you can control the sweetness by adding more or less syrup. Enjoy! I love this che! Keep posting! hi there, i found your blog while googling for "bun oc". it took me literally, YEARS to find out the name of my favorite noodle soup and i couldn't believe i managed to come across such a comprehensive recipe (and w/pictures!!). please keep posting! i am officially now your biggest fan. Hey, I work with the CheapOair travel blog (cheapoair.typepad.com) and we're interested in having you guest blog for us. Please contact me if you're interested. Thanks! Aldo. I love suong sa hot luu- i will make it next week. Thank you. Thx so much for the recipe! I'm a little confused- how do you get the water chesnut or fake pomegranate seeds to be red?